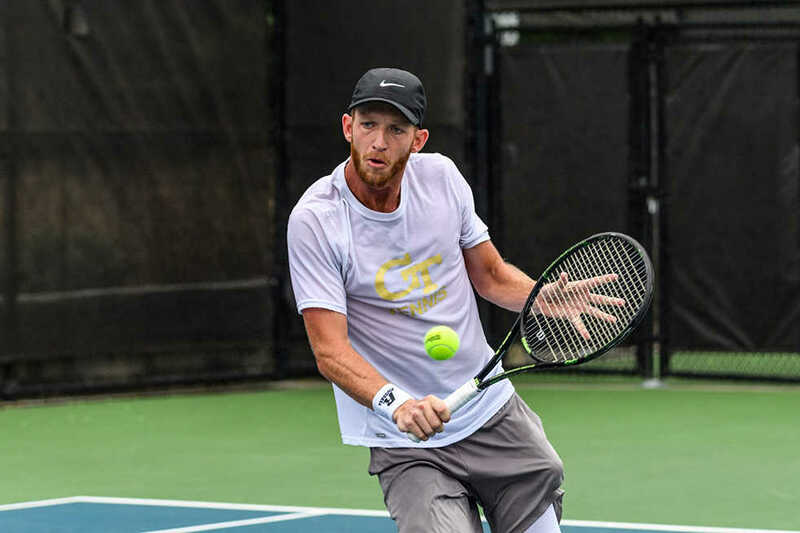 Tech tennis has progressed by leaps and bounds in recent seasons, culminating in some excellent collegiate players plying their trade as Yellow Jackets. On the men’s side of things, the forward momentum has been spearheaded by Christopher Eubanks, a junior-turned-professional who reached the second round of the US Open this year. With regards to the women’s program, Coach Rodney Harmon has added strength in depth which has culminated in the team starting the year ranked No. 9 in the nation by the Intercollegiate Tennis Association. In a turbulent fall season, the Jackets lost a key member of the roster as Christopher Eubanks called it quits on his senior year at Tech to pursue his professional career. Eubanks announced his decision to turn pro on Oct. 23. He left behind a legacy consisting of two consecutive ACC Player of the Year titles and the incredible feat of being undefeated on The Flats since April 19, 2015. “I can’t possibly put into words how thankful I am for my time at Georgia Tech,” Eubanks said in a statement in October. Despite the loss of Eubanks’s leadership and experience on the court, the men’s tennis team was still able to sweep past The Citadel on Tuesday, Jan. 9. The pair of 7-0 wins reflected Tech’s dominance, and the matches were the perfect way to open the spring slate for the Jackets. The women’s team have been able to fight for their place among the top ten ranked programs in the country. This has been prompted by heroic performances in the doubles, with the tandem of Paige Hourigan and Kenya Jones being ranked No. 5 in the US by the ITA. The future also looks bright for the Jackets, with highly regarded freshman duo of Victoria Flores and Ida Jarlskog providing hope for the coming years. Jan. 13 –15 on Tech’s campus, a chance for players to get experience in real matches on their home court. The fourth annual MLK Invitational tournament comes just days before a trip to Knoxville, Tenn. where the Jackets will face off against the Tennessee Volunteers on Jan. 19. Tennessee finished last season unranked and lacks significant veteran presence, so the Jackets will be expected to trounce them in short order. While the men will be competing on the home courts in Atlanta, the women’s team will be travelling north to participate in the Michigan Invitational. Following this, the ITA National Indoors on Feb. 9–11 will test the steel and determination of the high-flying Hourigan/Jones duo. However, the real test for Tech will be in the NCAA tournament, where the Jackets will likely join a whole host of other ACC outfits. Last year, the team was able to join Duke and UNC in the Sweet 16, but there are many other teams chasing at Tech’s heels. Head coach Harmon noted the ascendancy of ACC teams including Florida State, NC State, Notre Dame and Miami. The spring will be an exciting time for all Tech tennis fans. For the men’s team, it will be particularly intriguing to see which player steps up to fill the gaping hole left by the departure of Christopher Eubanks. For the women, onlookers will most likely see a continuation in the ascendancy of the team, particularly in the doubles. Whatever happens, everything seems to point to exciting times ahead for Tech tennis, as both the men’s and women’s teams continue to demonstrate their cases for national relevance.